Observations and models consistently indicate that variations in the Meridional Overturning Circulation (MOC) are strongly correlated to important climate changes such as variations in precipitation and surface air temperatures. To date, most MOC observations have been focused in the North Atlantic where the largest volume of new deep water is formed. 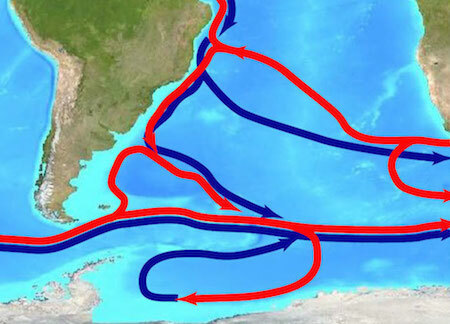 Numerical model studies have shown, however, that the South Atlantic is not just a passive conduit for the deep water masses formed in the North Atlantic and Southern Ocean, but instead actively participates in their transformation as they are exchanged with the other ocean basins. Recognition of this led to the formation of a group dedicated to both advancing our understanding of the role of the South Atlantic Ocean in the MOC system and the establishment of an observing system to capture key components of the circulation: this initiative is known as South Atlantic Meridional Overturning Circulation, or SAMOC. For more details about the international SAMOC initiative, results from five SAMOC workshops, SAMOC cruise schedules, and SAMOC related news and publications, please see the navigation menu on the left. Schematic of the MOC in the Atlantic Ocean with red indicating surface flows and blue indicating deep flows. SAMOC is endorsed by the International CLIVAR Scientific Steering Group and components of SAMOC are part of the US CLIVAR US AMOC Science Team. Tweets by SAMOC: Follow the #SouthAtlanticMOC hashtag.